Beautifully recorded with a variety of ensembles, from simple flute, piano and oboe trios to full orchestra. 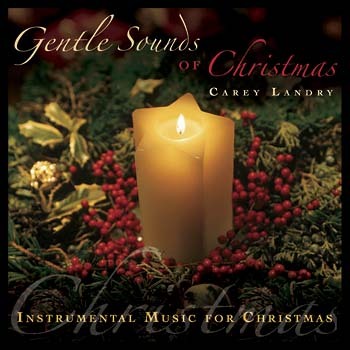 Contents include familiar carols as well as new songs by Carey Landry. The latest release in the Gentle Sounds series provides 13 soothing instrumental pieces for Advent and Christmas. A hospital chaplain and music minister, Carey knows well the needs of the people in the pews. "I believe there will always be a need," he explains, "for quiet, gentle music that becomes the background for prayer for some, a means of inner peace and relaxation to others, and for others, quiet music for prayer services in parishes and retreat centers." Gentle Sounds of Christmas fills those needs perfectly. Like the other Gentle Sounds collections, this CD is beautifully recorded with a variety of ensembles, from simple flute, piano and oboe trios to full orchestra. Contents include familiar carols as well as new songs from Carey's recent collection How Beautiful Is the Child. "Il Est Né le Divin Enfant," a French carol Carey sang growing up in Louisiana, features a lively interplay between flute and oboe. Other highlights include "A Child Shall Lead" and several suites and medleys of traditional carols. Embrace the peace of Advent and Christmas with Gentle Sounds of Christmas!